Oakwood Veneer Company, a Michigan-based supplier of veneers and related products, recently announced a new Italian Macassar ebony design. Oakwood Veneer’s David Rodgers notes that so-called engineered veneers—made by slicing less-expensive, faster-growing trees and dying, gluing, and basically reconstituting the fibers to emulate another species of wood—haven’t always had the best reputation. He says an improvement in the process can now deliver looks that rival the real wood. The photo compares the two. Oakwood Veneer’s engineered Macassar ebony veneer is on the left; real ebony veneer is on the right. Macassar or Makassar ebony (Diospyros celebica), a flowering tree native to Indonesia, is named for a seaport on the island of Sulawesi. It is prized for high-quality cabinetry and musical instruments due to its highly variegated wide streaks of brown and black. As with so many beautiful resources in the world, overharvesting has rendered the trees quite rare, and products made from them very expensive. Oakwood Veneer is betting that even wealthy yacht owners may therefore be pleased to settle for its engineered Macassar ebony. Last year Oakwood also introduced 24-mil (1⁄42“) paintable laminate sheets in 4‘ x 8‘, 4‘ x 10‘, and 4‘ x 12‘ (1.2m x 2.4m, 1.2m x 3m, 1.2m x 3.6m) sizes. 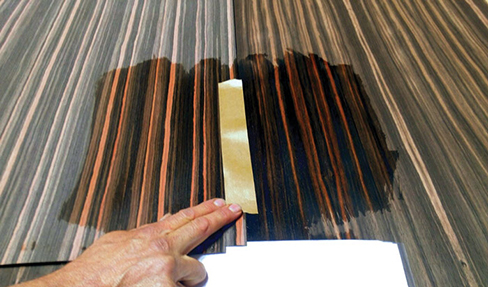 The smooth resin-embedded Plastiback laminate sheets are engineered to take paint, whereas plywood, MDF, and some veneers often do not take paint well, requiring tie coats and multiple finish coats. Prices start at $1.29 per square foot. Oakwood Veneer Co., 1830 Stephenson Hwy, Suite A, Troy, MI 48083 USA, tel. 800–426–6018, website www.oakwoodveneer.com.